It's pretty obvious that my blog isn't what one would call a destination for healthy food options. However, I do occasionally stick my big toe out of my usual dude food box and venture into things that flirt with the healthful. This would be one of those rare times. I will be completely honest and say that prior to making this I'd never tasted hummus. I know, I know... It just didn't appeal to me in the slightest. To me it had all the earmarks of something that only Birkenstock-clad folks eat. And, having now made it, I can't say that it's a favorite. My daughters (who apparently got some Birkenstock in them somewhere in the gene pool) assure me that this concoction of mine is good, but how do I know? They could be just stroking my ego despite my assurance that it wouldn't hurt my feelings if they thought it sucked. So, here, try it and tell me what you think. Start your grill and prepare for direct cooking over medium heat (325-350º). 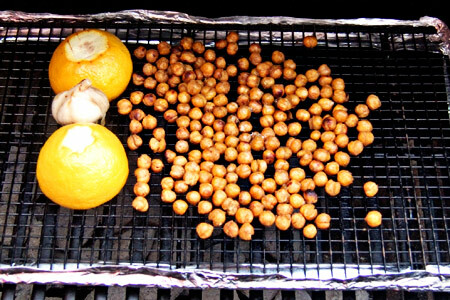 Wrap the edges of a fine mesh rack with foil to ensure the chickpeas don't roll off while grilling. The girls and I have dubbed this "the bean corral". Combined the chickpeas, garlic and 2 teaspoons of the oil in a medium mixing bowl and stir to coat. 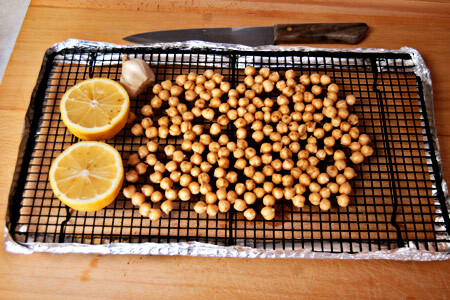 Arrange the chickpeas, garlic and lemon halves on the rack. Keep the bowl handy for later. Place the rack directly over the coals and cook until the chickpeas are golden and lightly charred, about 15 minutes, rolling them around gently with a spatula every five minutes. Remove the rack from the grill and let cool about ten minutes. Put the chickpeas in the original mixing bowl, squeeze the juice of the lemons into the bowl (no seeds, please), and squeeze the garlic cloves out of their paper into the bowl. Add the boiling water and salt and let soak 30 minutes to rehydrate the beans. Add the tahini, cumin, paprika, chipotle and 1 tablespoon of the oil to the bowl. Blend to a semi-smooth consistency with an immersion blender, or process in a blender or food processor. Put the hummus in a bowl, drizzle on the remaining oil and garnish with the chives. I'm loving your chipotle version of hummus. This might have to make an appearance this Sunday. John, I really really love Hummus. This is such a cool idea, I can't wait to make this!!! WOW, one of my favorite items + the smoke and char from the grill! YAY!!! Thanks, Lea Ann! Please let me know what you think. You don't look like the hummus type of guy;, but what a great idea to get that smoky flavor from the grill. I'm trying this when the weather gets warmer. 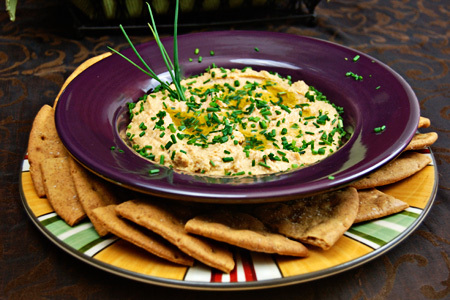 I love hummus and thank you for sharing your recipe. I'll have to make it for Alexis and she'll know. She's the hippy food eater in our family, ha ha. We pretty much live off of hummus at my house...but we always buy the plain kind at the store, nothing too exciting but it is still good. This is something I really want to try out! 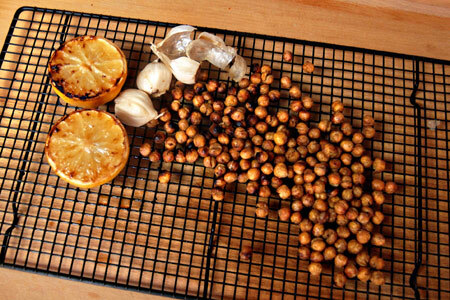 I never thought of grilling the garbanzo beans, that would give it such an amazing flavor. Liz - It really does add a nice added dimension of flavor. Give it a shot and let me know what you think. Does the water get completely absorbed by the beans or does this need to be drained off? Anonymous - The water is absorbed.